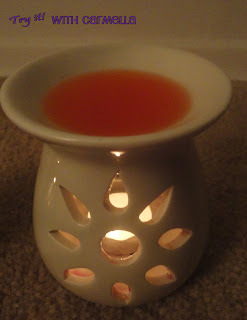 Clearly, I have a deep obsession with fragrance oils and waxes, which also means I'm obsessed with fragrance burners! Until last year, I wasn't really familiar with how these worked or even what they were. To anyone just trying fragrance burners for the first time, here's an easy description. 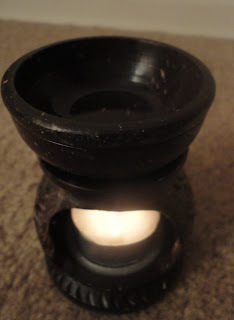 Fragrance burners are the tool you need in order to use fragrance oils and waxes. They will all provide a spot for your fragrance- you can simply place your wax cube, wax tart, or oil into the top area. Then, you'll light a tea candle underneath the fragrance. The bottom area of the burner will provide a big space where you can place the tea candle. You can also buy huge bags of tea candles for around $5. The big bags last a long time. By lighting the tea candle, the candle will provide heat that stimulates the fragrance oils or melts the fragrance wax cubes. Once heated, you will start to smell the fragrance throughout your home. Some fragrance burners also have nice designs. When they are lit and your lights are dim, they cast a nice shadow and look awesome. These photos are of my main burners that I use. I bought one at a big chain store. I bought the other at a small mom-and-pop store locally. Both are great! Look with the lights dimmed.